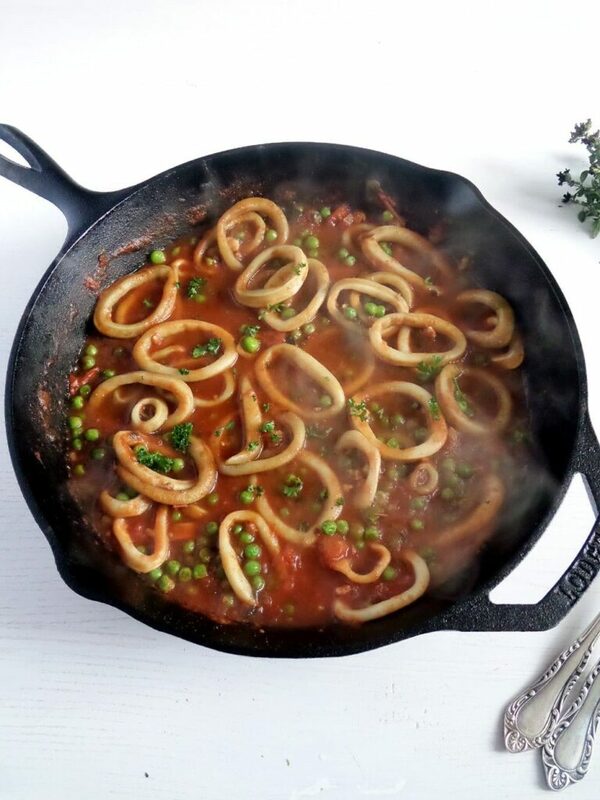 Calamari rings in tomato sauce with peas and served over spaghetti, something so simple yet so delicious. Calamari is not something I have often cooked at home. I did eat it in Chinese restaurants, mostly fried, but have never cooked it myself until quite recently, sometimes last year. I was so amazed at how good it was, that ever since I have bought and cooked calamari several times. I like it best the Italian way, if I can say so, with tomato or garlic sauce, lots of parsley, olive oil and served over noodles or with some Italian bread. 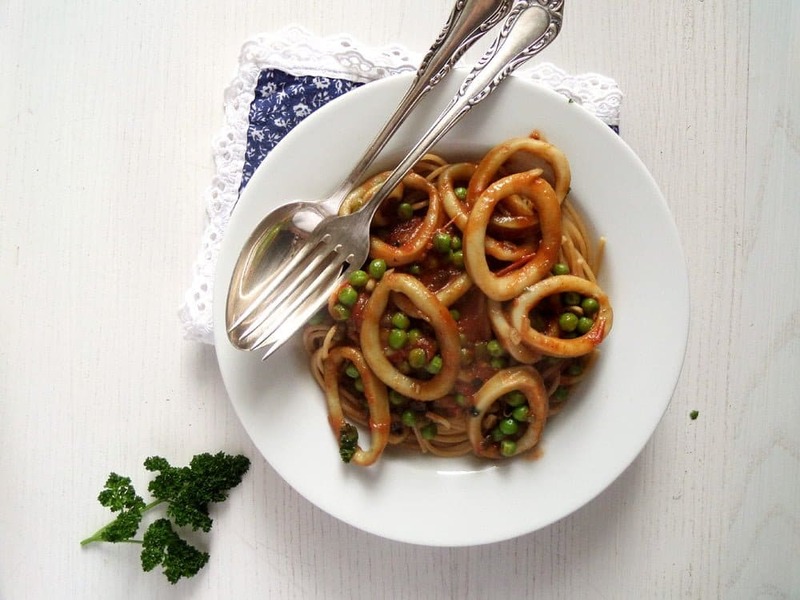 This version with tomato sauce and peas is just as delicious as the Mediterranean Calamari Stew I posted last year and if you enjoy eating calamari or squid, I am sure you will love this. Defreeze the calamari tubes if frozen, wash and pat dry. Cut into thin rings, about 5 mm/ ¼ inch wide. Finely chop the onion, the garlic cloves and the rosemary. Heat the olive oil in a heavy bottomed pan and cook the onions on a medium-low flame for about 5 minutes or until softened. Add the garlic, calamari rings, chopped tomatoes, red wine vinegar, sugar and rosemary. Add some salt and pepper to taste, bring to a boil and simmer, covered, for about 20 minutes. Add the peas and continue simmering, uncovered, for another 10 minutes. Chop the parsley and add most of it to the pan after you turned off the heat. Adjust the taste with salt and pepper. In the meantime cook the spaghetti. Serve the calamari in tomato sauce over spaghetti and sprinkled with the rest of the parsley. Wow, they’re so pretty in a dish like this. I haven’t ventured much into calamari but you’ve got me intrigued! 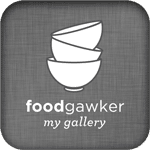 You should try calamari, Chris, if cooked corectly they are really really good. 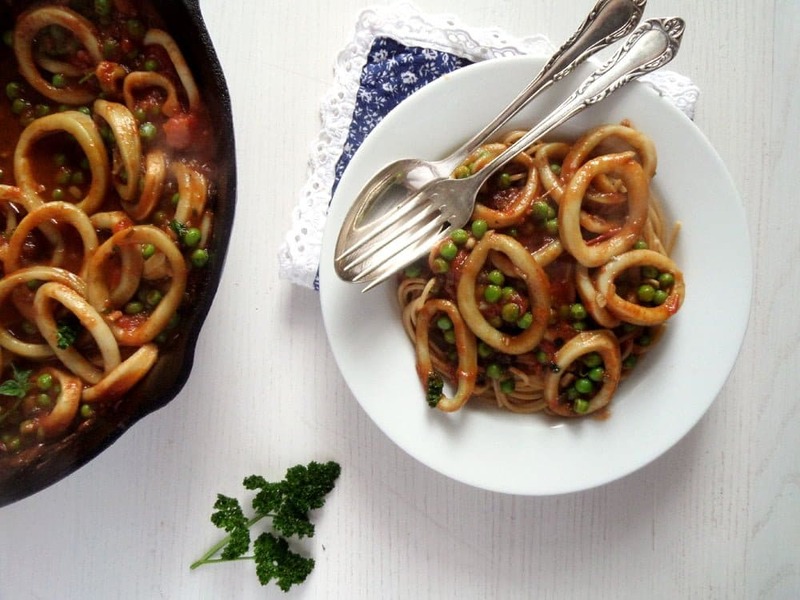 Yes, calamari is really easy to cook! I also for some reason rarely make calamari at home, thanks for the reminder, now I’m craving it! Your recipe is easy to make, yet looks so impressive! This looks amazing!! 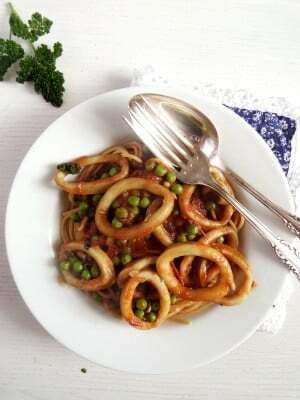 We love calamari but I’ve only cooked it a couple of times at home. Sometimes I buy frozen bags of mixed seafood that have calamari in it..does that count? : ) I have to make this! Great! Let me know if you liked it!